Msgr. Plaza was an active collaborator of the military dictatorship in Argentina. He supported ideologically the dirty war, and in 1976 he as appointed Chaplain of the Police of the Province of Buenos Aires, a post that gave him a very large salary and a chauffer-driven car. As such, he turned in many dozens of people to the security forces, including his own nephew Jose Maria Plaza (later seen at the ESMA concentration camp), and the children of Association of Mothers of Plaza de Mayo President Hebe de Bonafini. Msgr. Plaza also visited secret detention centers, where the disappeared were kept, and was seen there by survivors. He supported the impunity laws in Argentina, calling the self-amnesty law passed by the last Junta "gospelly": "the amnesty laws in all world traditions have never been a bad thing, it's something which quiets the spirits. We must not take them as the Nuremberg trials, to go searching and killing people, committing many irregularities and taking away poor Eichmann..."
He thought that the trial against the military commanders was "revenge by the subversion and garbage. It's like Nuremberg turned around, where criminals are trying those who defeated terrorism." Msgr. 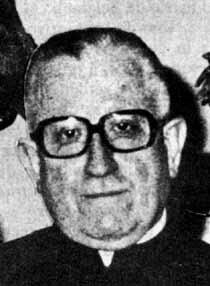 Plaza was one of 15 priests that appeared in the list of repressors of the CONADEP. He never protested his inclusion nor denied his links to the military dictatorship.